Our FAQ section has answers to some of the questions you might have. There are also more topics covered in our Buyers Guide articles section. +Why choose a concrete pool? Flexible: Concrete pools offer more flexibility when choosing a swimming pool as they are built to suit your unique location. Any shape, size or depth and can be designed to meet your specific requirements. Contrary to common belief, concrete swimming pools can be built both in-ground and out-of-ground. Individuality: Because they are so flexible, concrete swimming pools allow you to choose to add special features such as islands, steps & ledges, wet edges, beaches, bays and more. Finishing: When it comes to choosing interior finishes, concrete swimming pools are far more versatile, offering a wide range of finishings such as as tiles, pebbles, quartz, coloured render and more. » Read our article on Fiberglass vs Concrete pools in the Pool Buyer’s Guide. +What are popular pool sizes and where might it go on my block? The average pool size has reduced over the past 10 years along with the size of the average Sydney backyard. We are Sydney’s most technically capable pool builder and after nearly 60 years we’ve built every sized pool for every size of property. Some of our commercial pools have been positively enormous, while in contrast we also regularly install the smallest plunge pools in homes only a few metres wide. Consideration of uses for the total outdoor space, as well as budget, will determine how much of your yard can be occupied by the pool. Other factors that may influence your sizing choice may be; position of water or sewer mains, shading from major trees or the dwelling, access to other parts of the block (eg garage at back), topography of the land. Tip: Have a look through our photo gallery as the size of our pools are included as part of the specifications list. Tip: Consider the trees and sewer on your property so you can obtain the best position without having these relocated. +I don’t have much space. Can I still get a pool? We are often sought out by Sydney homeowners telling us there is limited space for a pool on their land but they are concerned they don’t have access or perhaps the room to carry out construction. Crystal Pools is highly experienced at building pools in inaccessible places: tiny terrace houses, high rise apartments etc… and we are the most capable company for technically challenging sites. We even install pools in Sydney homes that have next to no room for a pool. Be aware that works of this nature sometimes cost more for building support structures when we need to go over, around or under other structures. The easy way is to book a no obligation site assessment by one of our trained consultants and we can offer expert advice even before you decide to go ahead. A good concrete pool builder will help you by designing to suit the space you have and will advise the cost ramifications of varying sizes within that space. Also taking into account your existing and planned landscaping. +What design and construction issues might homeowners face if they choose the wrong builder? With an inexperienced builder the list could possibly be endless. Financial problems, completion delays, arguments over additional payments, damage to sewer or water mains, warranty claim issues. We’ve even heard many stories of pools popping out of the ground like a boat because the hydrostatic valve was incorrectly installed and failed (you get the picture). When shopping around ask the potential builder… Do you look after council approvals and water board? Do you offer a completion guarantee? How many pools have you built? What are your inclusions? Are your components (pipes, steel etc) imported or Australian made? Are you a Master Builder? Do you charge extra for temporary fencing? Can I inspect a pool you’ve built in a suburb nearby to me? If so, look for cracking, large radius corners (pool is shaped like a bowl), poor craftsmanship such as loose or uneven tiling, signs of messy mortar and concrete, even staining! Contact us on 9875 4555 for no-cost expert advice on what else to look for or ask about when shopping around. » For more information, read our article about selecting a pool builder in the Pool Buyer’s Guide. +Is salt water better than chlorine? Chlorine has been around for many years and is still the best way to achieve the cleanest and safest water to swim in. Salt water chlorinators also produce chlorine in smaller doses to keep your pool clean and safe to swim in. Crystal Pools is still yet to be convinced with some of the alternative products on the market. We have used other products on customers’ request over the years and have always reverted back to chlorine and salt chlorinators as they are proven performers. » For more information on this topic see our article Pool equipment: Pumps, Filters, Sanitisation and more. Waterline tiles are set directly under the coping and help with the appearance of your pool as well as the colour of the reflection on the water. The main reason tiles are great for your new pool is they are easier to clean and avoid the bath-ring effect should you ever let the water quality degrade dramatically. We recommend up to a 300mm waterline tile band to give the appearance the tiles are well under the water line. Coping is the flat walking surface surrounding your pool. Natural stone is an excellent product choice as they have a better life span and are not as susceptible to movement as man-made products can be. Sandstone and Travertine are very popular and come in a huge range of colours and styles. Sandstone used around a salt water pool should be treated with a sealer to prevent the salt from damaging the surface. +Do I need my neighbours permission? With a CDC (Complying Development Certificate) approval we do not need to notify your neighbors. The owner must comply with CDC conditions. Should your project require a DA (Development Application) through your council, neighbours will be notified by the council. Crystal Pools can organise all of your approvals and any notifications required. We always follow the BCA (Building Code of Australia) and build within these codes ensuring approval is achieved without delay. +What if we hit rock in the excavation process? With so much experience in all areas of Sydney, Crystal Pools has a good understanding of which suburbs are more likely to contain rock. Also we have found that most clients already know if there may be rock their area. Prior to excavation, we try to estimate the amount of possible rock so there is less likelihood of unwelcome surprises. +How long does a pool take to build? You should allow 3 to 6 months for the entire consultation, design, construction and finishing process. This will vary moderately depending on your approval type, weather, complexity of construction, as well as the landscaping and the finishes you select. » See our Buyers Guide for the feature article How long does the construction process take? +How much does an average concrete pool cost? » See our Buyers Guide article on How much does a pool cost? +What type of warrranty does Crystal Pool offer? We could not have stayed in business for over half a century by building anything less than the best. After more than 20,000 residential pools, this is how we work… We build it right the first time. We Back it. We Warrant it. We Honour it. We are long-standing members of the Master Builders Association, HIA and the Association of Pool & Spa Professionals. Structural work: We provide a 6 year warranty on the swimming pool structure as well as full statutory warranties on the pool interior lining and coping finishes. Plumbing: We provide a full statuary warranty on the swimming pool plumbing. Pumps & filtration: 5 year unconditional on-site warranty on the Crystal Pools range of super-flow pumps (at time of writing no other pool company in NSW offers this). Other pumps and filtration equipment have the manufacturer’s warranty. +What stages of construction are there? 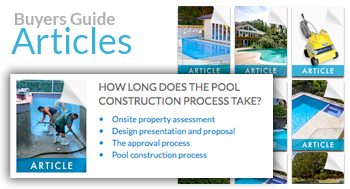 » For an in-depth look at the pool construction sequence see our detailed process map in the Pool Buyer’s Guide section, were you’ll also find other resources such as a slideshow and timelapse video of a pool being build. +Does Crystal Pools organise building approval from my local government? Yes. Once the Engineering Drawings have been completed Crystal Pools will prepare the paperwork and submit a building approval application to your local Council. We keep you up to date with the progress of your application. » See also Pool Construction Process.